"The Ancient Tea Road" "Tea and Horse Road"
Inspired by a TV special of NHK last night. is transported on horseback or muleback to Lhasa. From there, even further to Russia. The crossing of many mountain passes and deep valleys is rather dangerous. Crossing the many rivers is an adventure in itself. Sometimes men and animals are lifted one by one, hanging on just one rope over the whirling riverwater. Parts of the road are paved with stone. The tea is pressed in round cakes of a weight that a certain number of discs packed in bamboo leaves has a certain weight is just right for a horse or mule of the tea caravan. The tea is pressed under heavy stones, with men standing on the heavy stone for half an hour moving the stone back and forth. Pu-erh, Pu'er tea, Puer tea or Bolay tea (Chinese: 普洱茶, Japanese プーアル茶), this tea gets better with ageing, like a good wine. 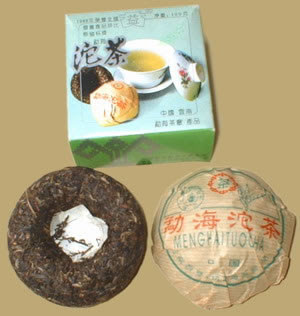 It is sold as green tea or post-fermented. 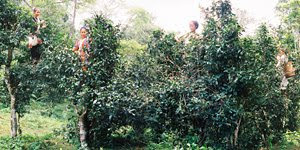 The tea trees of Yunnan (Camellia sinensis) are sometimes rather high and we saw farmers climb right high up to pick the leaves. Nowadays, lower trees for easy picking are more common. Some of the high old trees are revered as deities and get special offerings during the season. The history of Pu Erh tea can be traced back to the Eastern Han Dynasty, more than one thousand years back in time. The village of Yanjing is situated in a valley in the Mangkam County, on the border of Sichuan and Yunnan provinces. Yanjing was the first stop on the ancient Tea Leaf Trail from Southwest Yunnan to Lhasa. The population of the area is mostly Naxi, a tribe with an assimilated Tibetan lifestyle but old individual traditons and rites. In a narrow upstream valley of the Mekong / Lancang River, there is a well deep into the earth, right beside the river, where salt water can be scooped out. 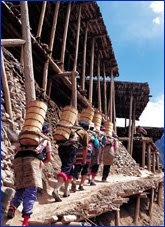 The water is carried to a set of man-made platforms, like rice terrace fields, spread out to dry in the wind and sunshine and the salt is then used as merchandise in the barter trade along the narrow valleys of this Himalaya Area, all the way toward Lhasa. The use of horses from Tibet, the only way of transporting commodities locally, ads to the attractiveness of the rugged scenery. 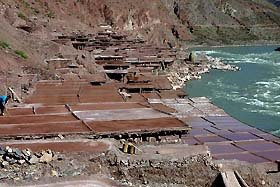 After the rainy season, the platforms nearest to the river are usually destroyed by the flood waters and have to be rebuilt. The well has a high wall around to protect it from the floodwaters of the river. Its salty content is proof of the emergence of Himalaya Mountains from the seabed many many many thousand years ago. The hard labour of the salt fields is carried out by the womanfolk, since the men are mostly out in the trading caravans. One woman is married to all the brothers of a family. The woman's work of carrying the water and salt packages is very hard. Sometimes they even collect salt from "icicles" that form below the platforms. This is the most purest salt they have and used for religious ceremonies. Yet these people are very very poor and some can not even afford special cloths for their own wedding ceremony. Here are some photos I found about this remarkable place! More photos of Yunnan from Ikokunotabi. has always been a main industry in Yanjing. There are no written records as to when salt mining and trading began there, but the famous Tibetan epic King Gesar makes mention of wars in the area arising from salt resource disputes. It was the town's long hours of sunshine and rich wind resources that engendered the Yanjing natural wind drying method of salt collection. Farmers first fetched water from the salt wells by the Lancang River, and transported it to their homes in wooden barrels where it was emptied into the saltwater ponds in their courtyards. After letting the brine concentrate, it would then be poured into a salt field where the water evaporated in the hot sun, leaving the salt residue. White salt is of the highest quality and is used as a food ingredient, while the deep red salt produced this way is used to boil tea or feed livestock. In years past Yanjing residents would take salt to cities in Yunnan and Sichuan and barter it for production tools and daily necessities. The traditional wind-drying method is still practiced in Yanjing today. There are now more than 300 salt producing farmers in three towns in Mangkam County that work on 2,800 salt fields. These primitive production methods, however, keep the production volume low. 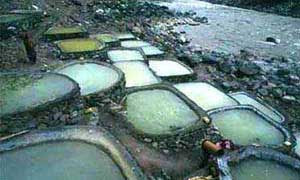 As convenient transportation and modern logistics ensure that the local market is well supplied with fine salt, there is little chance of developing the traditional salt production techniques handed down over generations by Naxi women in the area. 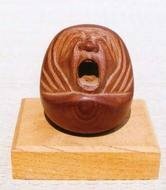 According to some legends in Yunnan Province and Tibet Autonomous Region, it is said that Qian people (Naxi ethnic group) found the treasury place with bittern earliest. Maybe it is huntaway leads people to the place or they occasionally discovered it as some certain animals used to drink water here. It is easy to imagine that local people in Yunnan-Tibet plateau would be very happy to find the bittern drifting along just like discover gold mine. More and more people gathered here to rig up an awning to make salt by evaporating brine in the sun. Following the salt production, villages appeared and then, land was cultivated for crops, while thousands kilograms of salt were transported outside by mules to exchange other products for daily life. However, the salt well which made wealthy for local villagers was been envied. The two ethnic groups, Tibetan and Naxi, began wars for many years in order to vie for the land of gold. Although Naxi ethnic group lives in both of Upper Yanjing and Lower Yanjing, which is separated by only a ditch, the two parts of Naxi have different religious cultures. People in Upper Yanjing profess Catholicism, and there is an only Catholic chapel in Tibet. And people in Lower Yanjing have faith and trust in Tibetan Buddha, and the white Buddha pagoda is built up on the roadside. The two religions in Yanjing coexist in harmony, which is regarded as a unique place of cultural interest. The Lancang River is a river providing moisture for the fields and people on both sides. Not only does it bestow bittern, but also it has high-temperature clear water gushing out of hot springs, including Quzhika Spring, one of the best ones in Yanjing. Green leaves of trees make a shade near the spring with vaporizing fog. 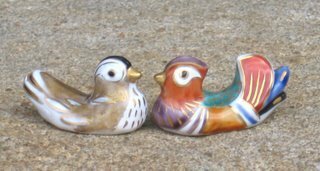 Tradition has it that the story took place hundreds of years ago. Dameiyong, a goddess, befell Quzhika, where local folks suffered from the outbreak and spread of epidemic diseases. People's hardship and miserable life moved the goddess into tears, which turned into 108 hot springs to ward off disasters and bring blessings to the villagers.